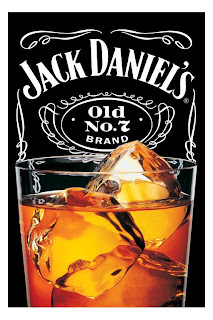 Every so often, even on a late Saturday night, while the world is partying, I like to enjoy or as I say it "have a late night conversation" with Jack. Usually accompanying me will be my music, a scotch glass with about 4 cubes of ice and just a couple ounces of Jack Daniels. Most people I mention this to tend to cringe at the very name of the drink, but I think I've acquired it into being my drink of choice. I usually have a list of internet goodies in which I like to post and comment on, but tonight it's a pure reflection of late night working. I'm currently combing through some designs and writings to finish up details and planning out new projects. Mind you, the Jack is not to get inebriated or chase some fuzzy feeling. I think I've become like one of those old men you see on TV, that house their golden favorite drinks in a crystal bottle, and pour a drink to just toast to an event or conversation of choice. My whole thought is this, at some point in your life you have to do things whether that be enjoying a drink, eating a meal or seeing a movie, because you want to.. out of pure choice. I'll never understand those at an open bar that are willing to drink some crappy sponsored rum that makes them gag just to catch a buzz. I also find it bizarre that as an adult, anyone would ingest anything they despised purely out of convenience or lack of other quick choices. So many times I hear "I absolutely can't stand McDonalds breakfast anymore but it's just so fast." With movies.. many of us will sit at home and mindlessly stare at a horrible movie, in hopes that it'll get bettter, just because of a lack of choices on other channels. I think there's a freedom in becoming an adult, that we should embrace and practice, where we are allowed to do almost everything based on sheer choice. It is because of this, I refuse to drink anything I hate. If it is inevitable that I get old and eventually decay, I'm going to ensure I enjoy as much of the process as possible.